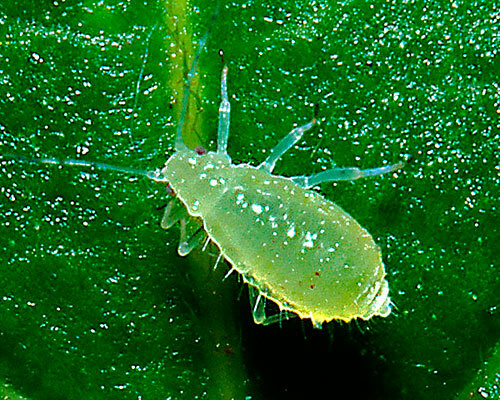 Apterae and alatae, 1-2 mm large, are shining yellowish white to greenish white with tarsi and ends of the antenna segments black. They live without ant-attendance at the underside of the leaves, not in groups but more or less scattered. Barbagallo, Binazzi, Pennacchio & Pollini (2011a), Barbagallo & Massimino Cocuzza (2014a), Barbagallo & Pollini (2014a), Blackman & Eastop (2017), Durak, Durak & Borowiak-Sobkowiak (0000a), Heie (1982a), Łabanowski & Soika (2011a), Lampel & Meier (2003a), López Rodríguez & Nieto Nafría (1983a), Mier Durante & Nieto Nafría (1981a, 1997a), Nieto Nafría & Mier Durante (1981a, 1998a), Osiadacz & Wojciechowski (2008a), Petrović (1998a), Ripka, Reider & Szalay-Marzsó (1998a), Stroyan (1977a), Tambs-Lyche & Heie (1984a), Weis (1955a), Wieczorek & Kanturski (2011a), Wojciechowski, Depa, Halgoš ao (2016a).